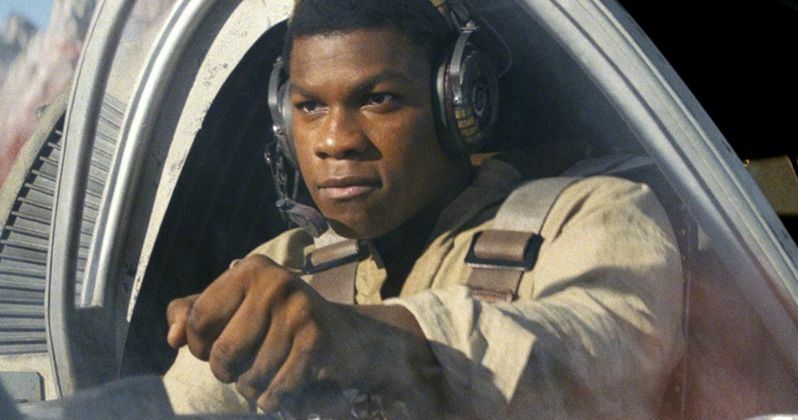 Some new footage of Finn, Poe and Rey in Star Wars: The Last Jedi has surfaced online. With the release of the movie just over a month away, Disney and Lucasfilm are in full-blown promotion mode. With that, a brand new TV spot for Star Wars: The Last Jedi has been released. It's quite short, but it actually gives us quite a bit to chew on and adds a little extra layer to Rey with one, very interesting shot. The video starts out with Finn, who's still rocking his buddy Poe's jacket, saying, "May The Force be with you." We then cut to some quick action shots, which have been revealed in previous trailers for Star Wars: The Last Jedi. Then we move to Poe, who is doing what he does best in his X-Wing with BB-8. While the sequence with BB-8 getting a shock was revealed in a previous trailer, Poe gets a fun little one-liner here. Then we move to Rey, who's seen doing training with Luke's Lightsaber, which we've seen previously. However, this time, we see her give a pretty smug smile after she finishes, which is pretty interesting. There's also a little glimpse of Finn's fight with Captain Phasma. It's been teased quite heavily in the marketing for Star Wars: The Last Jedi that characters are going to be operating in the grey. Specifically, it's being hinted at that Rey could be shifting to the Dark Side. This smug grin, which seems to be acknowledging a little bit of pride in her skills, could just be for fun. But maybe her power is going to go to her head? It's a noteworthy shot, either way. There's also Kylo Ren, who is still clearly conflicted, drifting a little between the darkness and the light, even though he's doing his best to extinguish the light. Lucasfilm seems to be quite confident that director Rian Johnson has crafted an excellent movie with Star Wars: The Last Jedi. While the studio has had issues with directors, having fired, Josh Trank Phil Lord and Chris Miller and having to bring in some extra help for Gareth Edwards on Rogue One, things have gone almost suspiciously smooth for Johnson on Star Wars 8. That being the case, it was recently announced that they're allowing him to develop an entire new trilogy of Star Wars movies unrelated to the Skywalker saga. That bodes pretty well for Star Wars: The Last Jedi. Tickets are on sale now for Star Wars: The Last Jedi, which arrives in theaters on December 15. If you haven't picked them up already, the sooner the better, as the movie is expected to have the second-biggest opening weekend of all time, trailing only Star Wars: The Force Awakens. Be sure to check out the new Star Wars: The Last Jedi TV spot, courtesy of the Zcure1 YouTube channel, for yourself below.